Fifty-five readers love this post. Fall is my favorite time of year. The crispness of the air. The beautiful , changing colors of the leaves. It inspires me to reflect on the year that has almost gone by. Personally for me this has been a year of surprise endings but also exciting new beginnings. All these places ,people and events have their moments and I often stop and think about them. To me fall is the closing of one door and the opening of another. I sometimes name my cocktails after songs . My favorite group of all time are The Beatles. Their songs really resonate with me for so many reasons. I’ve loved them ever since I was a little girl. I was lucky enough to meet Paul McCartney several years ago.Seriously lucky! A highlight of my life to this day. How many of us get to meet our musical idols? One of my favorite Beatles songs is In My Life. In a way it reminds me of fall and the year that has gone by. Some things have gone and some remain. It's such a beautiful song. Melancholy and reflective. Very nostalgic. So now I present to you my fall cocktail In My Life . The base spirit in my drink is Old Duff Genever. A true Dutch Genever created by charming Irishman Philip Duff. An industry expert who spent quite a bit of time in Holland so he knows his genever! With malt wine and botanicals it brings a rich, rye flavor to my cocktail. The fall season brings other decadent ,delicious flavors as well. Apples and pears , dried fruits and sherry. I chose Marie Brizard Pear William for the pear essence .Using fruit from Alsace it imparts the rich, sweet flavor of biting into a fresh pear. Calvados Boulard V.S.O.P. Brings crisp apple with notes of vanilla, nuts and wood. Lustau Pedro Ximenez San Emilio PX Sherry adds raisins, dates and exotic spices. 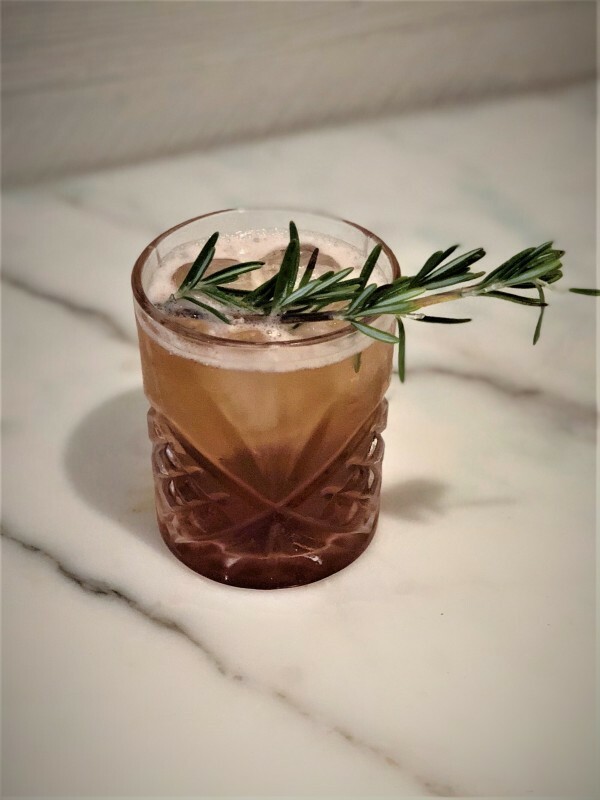 I then garnish my cocktail with a sprig of rosemary which signifies remembrance. I also happen to really love rosemary. All blend together beautifully for an amazing fall cocktail. So for the places that I remember and the lovers and friends that I still recall . I'll stop and think about them and raise a glass and toast to fall. No season compares to you. In my life I love you more. Cheers! Combine all ingredients except for garnish in a mixing glass with ice. Stir and strain over ice in a large rocks glass. Garnish with a slapped sprig of rosemary.